Any cognitive dissonance that may arise from watching Ben Kingsley—the actor who played Gandhi—interpret genocidal monster Adolf Eichmann dissipates quickly in Operation Finale: Kingsley delivers a complex and masterful performance, generating more empathy for a Nazi than you might expect. 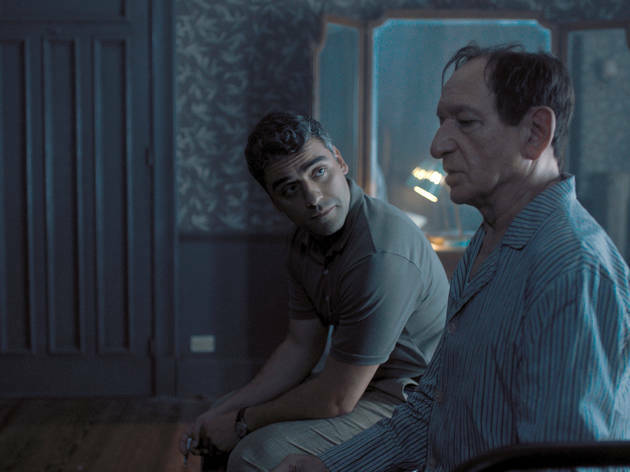 Oscar Isaac is effective as the Israeli agent on his tail in 1960s Argentina, and their weighty interactions at a safe house call to mind Clarice Starling’s early encounters with Hannibal Lecter—a younger agent battling a seasoned villain through a chess-like sequence of probing, dueling dialogues. Still, Isaac can't match Kingsley’s subtle bravado. And that one-sided power dynamic raises a thorny issue: What happens when your Nazi mastermind is the most compelling thing about a historical drama? In Schindler's List, Steven Spielberg solved a similar challenge by leveraging rich, relatable performances from Kingsley and Liam Neeson against the hypnotic vitriol of Ralph Fiennes’s vicious lieutenant. But director Chris Weitz's Operation Finale fails to offer a noble character who can offset the frightening charms of Kingsley's Eichmann (a fleeting exception: Simon Russell Beale's 90 seconds as eloquent prime minister David Ben Gurion). The technical elements of the film are strong, and Alexandre Desplat’s score is outstanding, but the cast deserves a better script than first-timer Matthew Orton’s workmanlike effort. Rarely does the movie spark terror or raise the pulse; it is neither gripping nor ambivalent enough to command the respect of Spielberg’s similarly-themed Munich. But as a showdown of wits, it’s engaging enough, with Kingsley wrangling memorable nuance from an unlikely role.